Hello! I hope you're all having a great weekend! It is October, and we are still experiencing 100+ degree weather here.. ugh. Yesterday was World Card Making Day, and I had big plans to spend some time in my craft room making some cards for fun, but I had to finish up some DT assignments first. Then I spent some time preparing for Sabrina's school scrapbook project and before you know it, Saturday had come and gone! I was in a bright color mood, so I pulled out some patterned paper from American Crafts Backyard collection. First is sketch, VSWCMD1. I stamped the medium flower from Dream Big twice, cut one out and popped it on top of the other. I added a large sunburst in the center of the flower and black flat back pearls. I was going for a more subtle look with VSWCMD2. I went a little wild with my bow, so it's a little hard to see the sentiment, which reads, "Blue Skies are Coming Your Way" (from Blue Skies). My next card is also fairly similar to the one above. It uses sketch, VSWCMD3. 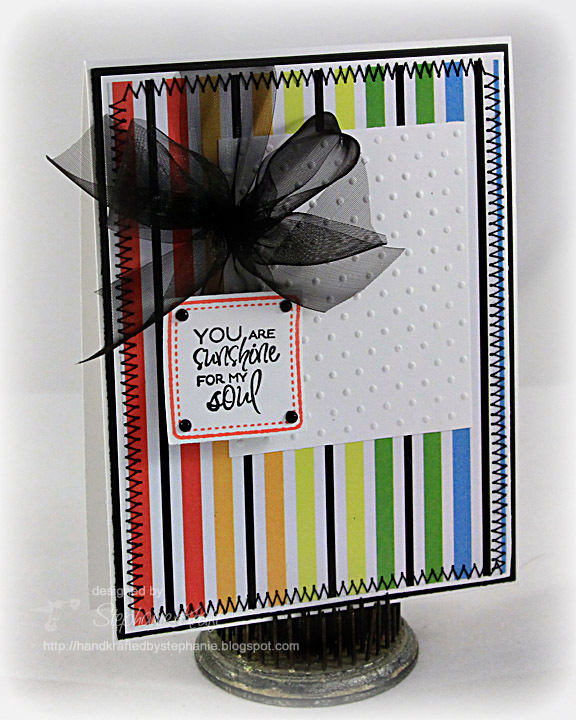 The square frame and sentiment, "YOU are sunshine for my soul" are from Happy Hello. 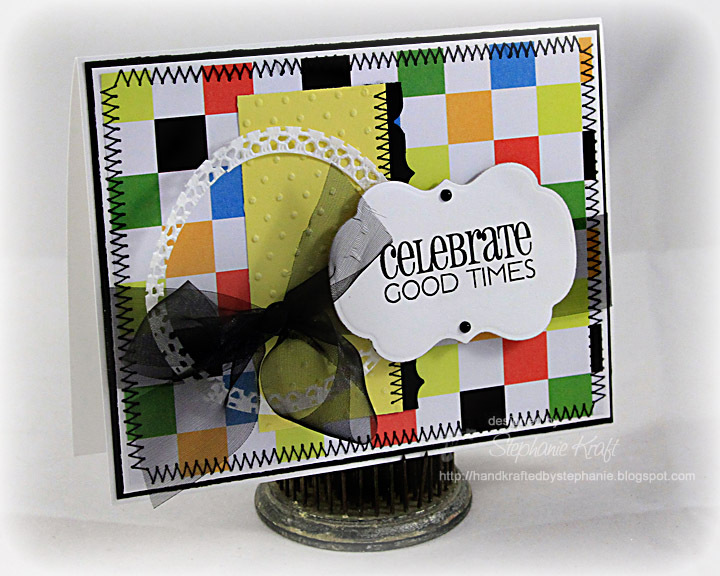 My next card uses a sentiment from Birthday Bash. This is sketch VSWCMD4. You'll notice a lot of the same elements repeated on my cards (Swiss Dots embossing folder), black stitching, black sheer ribbon and black pearls). My final card uses VSWCMD5. When I first saw the sketch, the rectangular panels made me think of the sheet of notebook paper from Blue Skies. The quote reads, "Within your heart keep one still, secret place where dreams may go." Sparkle is releasing 6 new stamps this Saturday.. peeks begin tonight here. You won't want to miss any of it! I will have a SCRS peek tomorrow night. I will be back tonight with another MTME release project. Have a wonderful day! Thanks so much for stopping by! 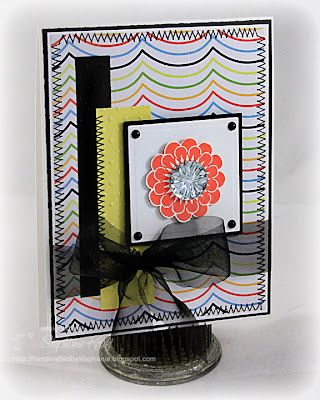 Accessories: Square Nestabilities (Spellbinders), Swiss Dots embossing folder (Provo Craft), Sunburst, Black pearls (Pizzazz Aplenty), Sheer ribbon (May Arts), Foam tape, Thread, Sewing machine. 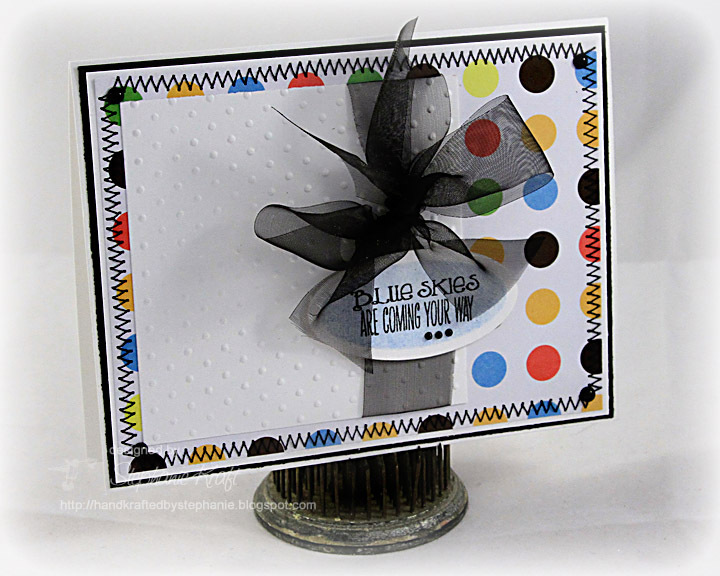 Accessories: Petite Oval and Scalloped Petite Oval Nestabilities (Spellbinders), Swiss Dots embossing folder (Provo Craft), Sheer ribbon (May Arts), Black pearls (Pizzazz Aplenty), Foam tape, Thread, Sewing machine. 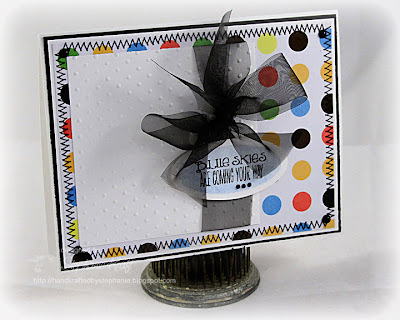 Accessories: Swiss Dots embossing folder (Provo Craft), Sheer ribbon (May Arts), Black pearls (Pizzazz Aplenty), Foam tape, Thread, Sewing machine. 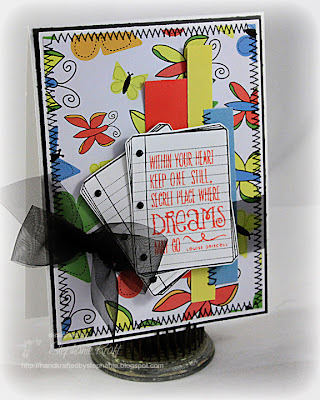 Accessories: Labels Fourteen Nestabilities (Spellbinders), Swiss Dots embossing folder (Provo Craft), Upper Crest border punch (Fiskars), Sheer ribbon (May Arts), Black pearls (Pizzazz Aplenty), Doily, Foam tape, Thread, Sewing machine. Accessories: Sheer ribbon (May Arts), Black pearls (Pizzazz Aplenty), Foam tape, Thread, Sewing machine. Wow! 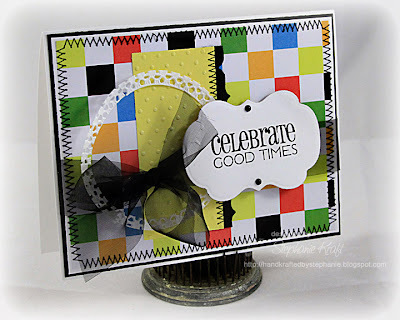 You've been stamping up a storm! These are all so fabulous, Stephanie! Love the happy colors! Gorgeous set of cards. 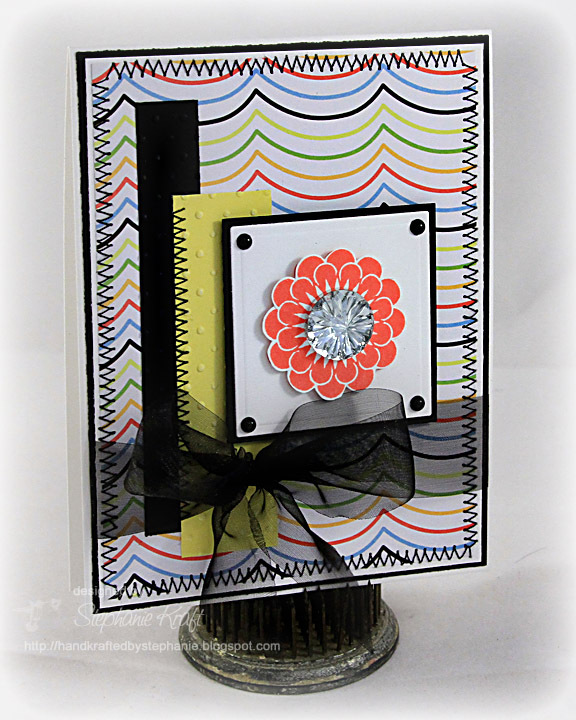 Love the bright colors and your take on the designs! 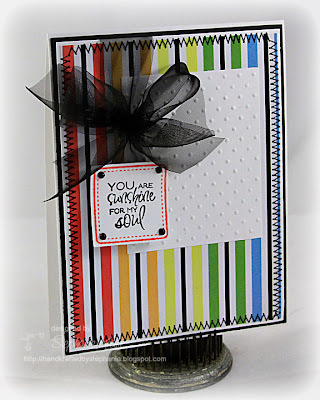 Wow, Stephanie, what a great idea to coordinate all of the cards so that they make a lovely set! I'd never in a million years have thought of that! Well done!